With the Bounced Manager module included in G-Lock EasyMail you can easily process bounced messages after your email campaign is complete. The Bounced Manager provides you with the most accurate bounce detection solution. It downloads your bounces, classifies them, extracts the email addresses and saves the addresses to a file. After that you can delete bounced messages from the server. 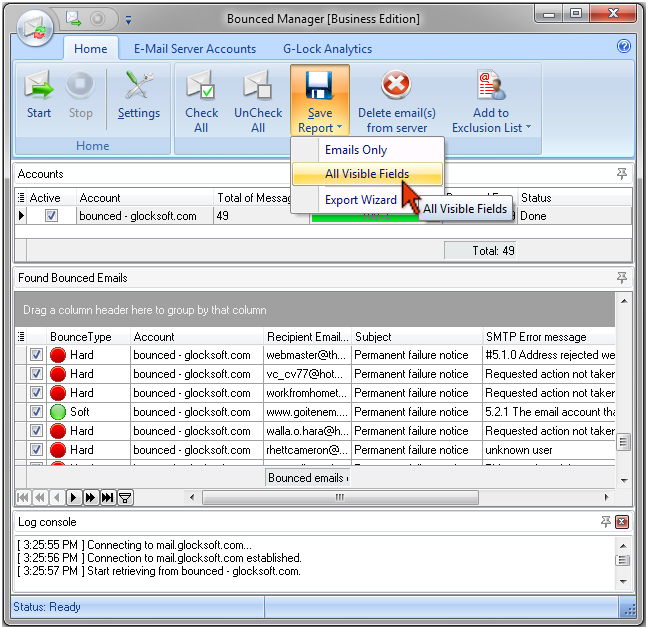 With one mouse click you can add bounced emails to the Exclusion list of the group or database in G-Lock EasyMail Address Book and not send future emails to these contacts anymore which means you will prevent your IP from being blacklisted for repeated sending to invalid email addresses and keep your good sender reputation. Plus, your future email campaigns will be sent faster because G-Lock EasyMail won't waste time for trying to send the message to invalid emails.